Ahhhh, the dog days of summer! August brings hot summer days, tall glasses of lemonade, and katydids and crickets singing long into the nights. Along with these hot summer days comes the risk for heat stroke. Heat stroke – also known as heat exhaustion, hyperthermia, or heat prostration – is a serious concern for dogs. When their body temperature rises from the normal 101°F – 102.5°F (38.3°C to 39.2°C) to roughly 104°F – 105°F (40°C – 40.6°C), they lose the ability to regulate their internal temperature, which can cause organ damage and even death. They don’t sweat like we do. The main method for cooling in dogs is panting. Dogs with short snouts, such as Bulldogs, Boxers, and Shih Tzus are even more susceptible to overheating because they can’t pant as well as dogs with longer snouts. They wear fur coats. While their coats actually help to promote cooling by trapping a bit of cool air close to the skin, it only works for so long. They can’t head to cooler locations. Unlike us, pets cannot head to the mall, library, or cooling center on their own – they rely on us to help keep them cool. If your dog is indoors for most of the day and you have air conditioning, that’s great! If you don’t have air conditioning, keep your windows and curtains closed during the day to keep the heat out, and keep some fans running to help cool him down. Open the windows at night to let the cooler air in. If your dog spends most of his time outdoors, make sure you provide plenty of shade and encourage him to rest in shady areas by putting his food and water bowls there. You can also use an outdoor fan; make sure you keep the cord out of his reach. Some dogs enjoy a plastic kiddie pool full of water placed in the shade. Be sure your dog can get in and out on his own and supervise his dips in the water. If you have a swimming pool, please remember that dogs can’t climb ladders. Train your dog to use the steps if your pool has them. 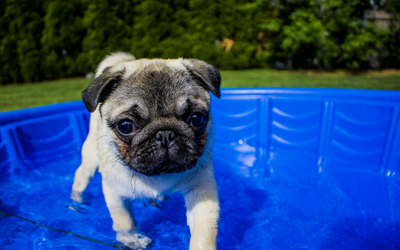 Never leave your dog unattended in your pool – accidental drownings happen every year when dogs exhaust themselves trying to find a way out. You must provide a constant source of fresh water for your dog. Toss ice cubes into the bowl to keep the water cool. Restrict rigorous walks and playtime to short sessions in the early morning or late evening. If temperatures and humidity remain high in the overnight hours, skip long walks until the heat breaks. Be sure to frequently stop for water breaks on walks. Bring along a dog water bottle or collapsible water dish with lots of cold water. You could even bring along a misting bottle so you can spray him off every now and then. Try to keep to the shady side of the street and remember that your dog’s feet are just as sensitive to hot asphalt as your feet are. When you return home, you can hose your dog down if he likes that, but remember to run the water first, since any water sitting in the hose will be hot enough to burn your dog. Leave your dog at home. Never ever, ever leave your dog in the car. Not on cooler days, not in the shade, not with the windows open. If you are stopping anywhere that you can’t bring your dog, leave him at home. Heat stroke is a very serious issue, and preventing it is far better than treating it. Enjoy the dog days of summer and take care to prevent heat stroke in your dog! © 2019 Companion Animal Hospital in Yorkton, Saskatchewan.